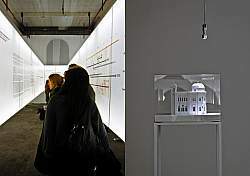 The exhibition was the result of the research overseen by Polifactory about Abelardo Lafuente (1871-1931), the first Spanish architect in China, who introduced the moorish spanish style in Shanghai, and was responsible for the design of some of the most luxurious ballrooms in Asia and other landmarks of the city. 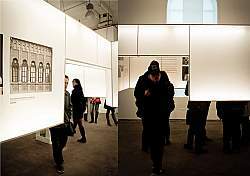 The exhibition was held in the historic Bund area, inside the South Bund 22 building. 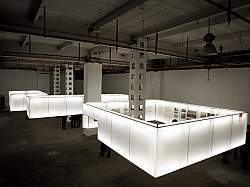 From a storage place during the French Concession to a factory during the early years of the PRC, the building has been renovated recently to house luxury businesses. 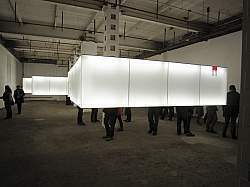 For this exhibition the architects decided to use one of the rooms that was not yet finished. 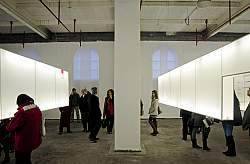 Original portions of the space remain exposed which helped foster different levels of dialog between the exhibits and the building itself, not only aesthetically but also in temporal and social terms. 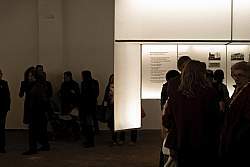 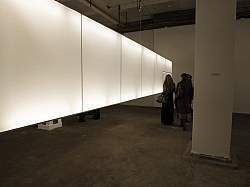 The highlight of the exhibition for the public was the way in which was presented the research findings – screened onto the inside of three large-scale “walk-in” lamps. 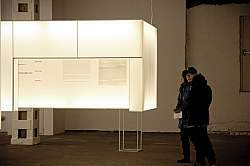 The concept design was based on using a common element of people’s daily life in China: paper lamps. 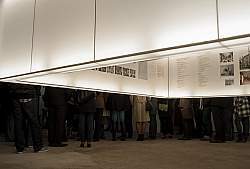 The layout was designed in such a way that the information would be unveiled piece-by-piece as the public enveloped itself in the spaces created by the three square-shaped lamps. 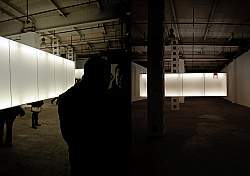 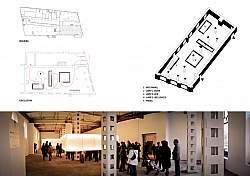 Each lamp presented a part of the work, life and legacy of Abelardo Lafuente, while together they organized the space and provided smooth light to guide visitors and illuminate the old factory space. 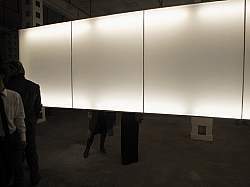 The exhibition was open for one week on the Bund and will be shown at further locations around Shanghai and eventually in Spain.